Apple has released the very first update for the Apple Watch operating system. Watch OS 1.0.1 update has landed and it brings several improvements to the smartwatch. 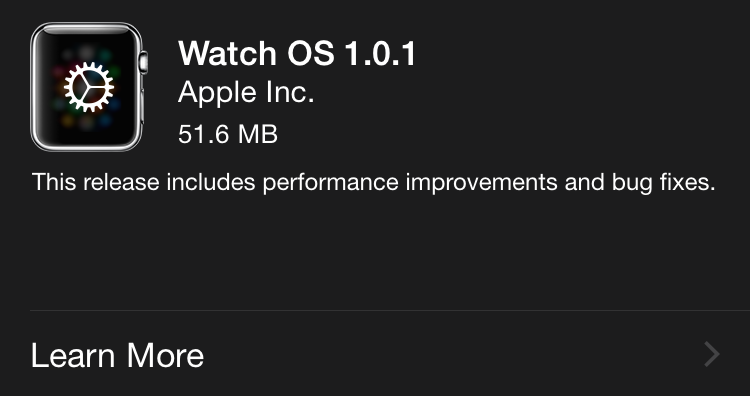 The Watch OS 1.0.1 update is now available for download via the Watch Companion app on your iPhone. You can check for the update by opening the Companion app on your iPhone and navigating to General>Software Update. In the release notes, Apple says that additional language support has been added for Brazilian, Portuguese, Danish, Dutch, Swedish, Russian, Thai and Turkish. The update also fixes and brings several new improvements to the Apple Watch. Many users reported issues with the Watch not responding to ‘Hey Siri’ most of the time. This should now be fixed/improved in Watch OS 1.0.1. When updating, make sure your Apple Watch has more than 50 percent of charge and that it’s connected to your iPhone. Let us know if the update improvement Siri and other aspects of the Apple Watch for you. How to Unlock your iPhone running the iOS4.1 firmware with UltraSn0w 1.1-1!